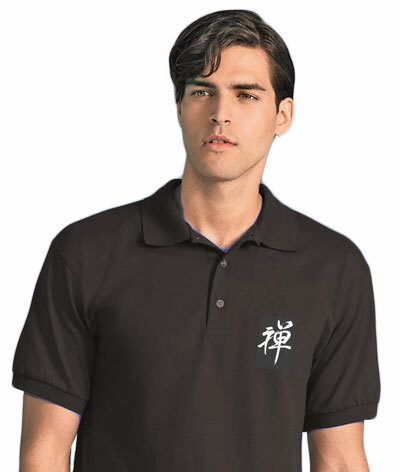 Calligraphy, literally "beautiful writing," has been appreciated as an art form in many different cultures throughout the world, but the stature of calligraphy in Chinese culture is unmatched. In China, from a very early period, calligraphy was considered not just a form of decorative art; rather, it was viewed as the supreme visual art form, was more valued than painting and sculpture, and ranked alongside poetry as a means of self-expression and cultivation. 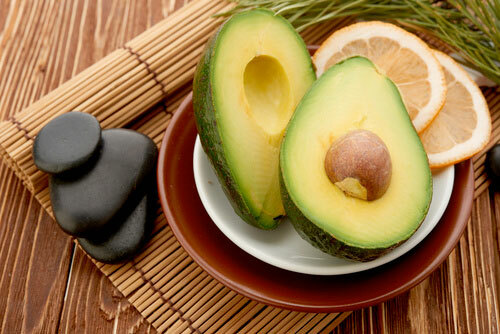 It is said that "a picture is worth a thousand words"—but in the Chinese language, the words themselves are pictures. 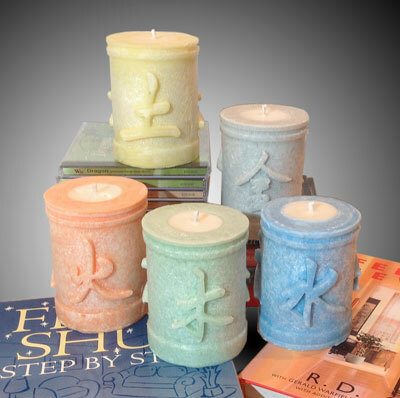 This makes Chinese calligraphy a perfect way to convey inspirational thoughts and concepts. 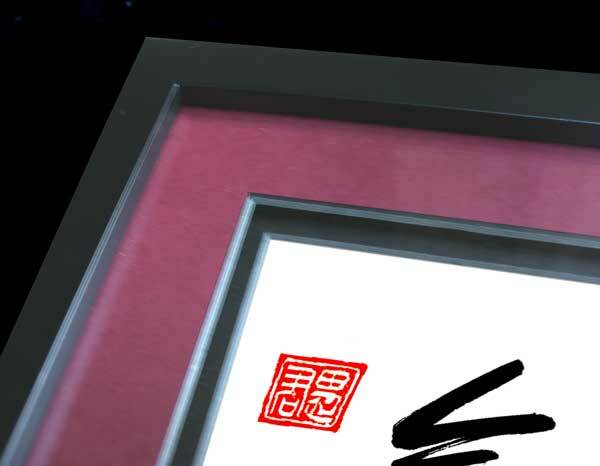 Chinese character for Dao (Tao) in a vertical curved glass frame. 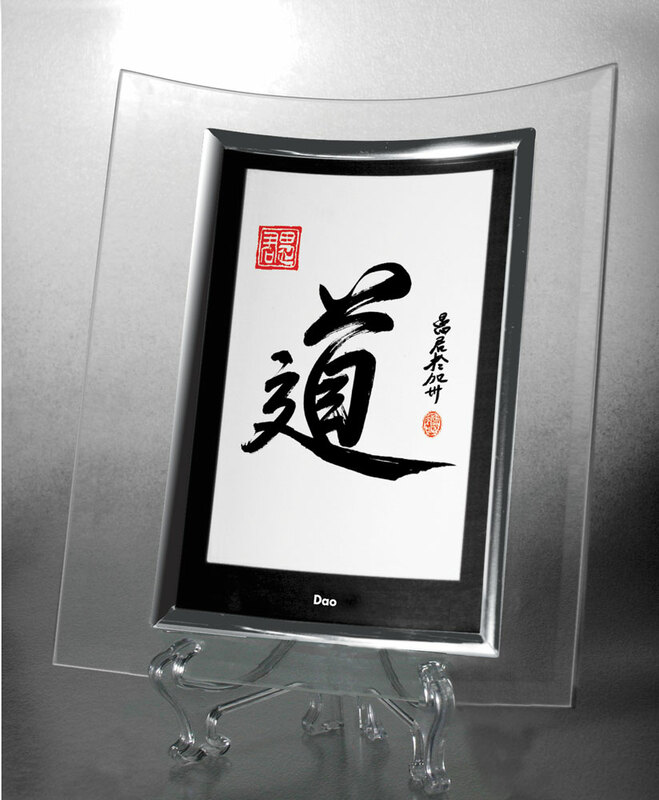 Inspirational Chinese calligraphy displayed in a curved glass frame with acrylic stand. 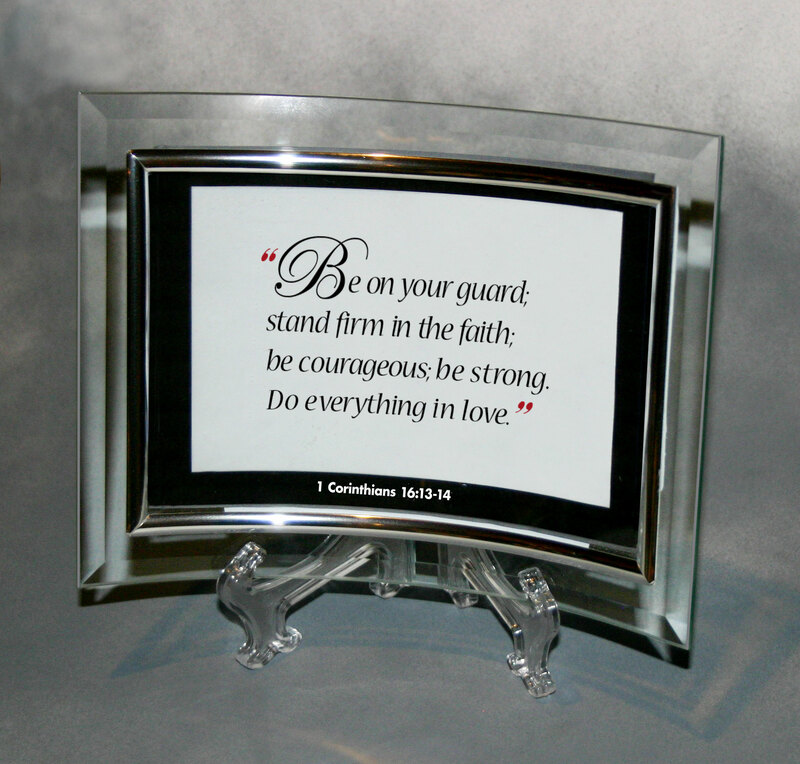 Glass frame size: 6" x 7.25" with 4" x 6" character insert. The character is brushed in running script style by our artist, then scanned and printed on acid-free 100% cotton archival paper. A unique curved glass frame focuses attention on the character and makes a simple, yet beautiful way of displaying the character on a desk, shelf, or table. We have over 70 different designs available. The single-sheet glass frames are curved in either a vertical or horizontal direction depending on the artwork. They were designed to stand on their own, but we include an optional acrylic tripod to make them more stable. There were many ancient Chinese philosophers with timeless wisdom and advice that is still relevant in our modern world. Our graphics department has selected some of these short quotes to display in horizontal curved glass frames. 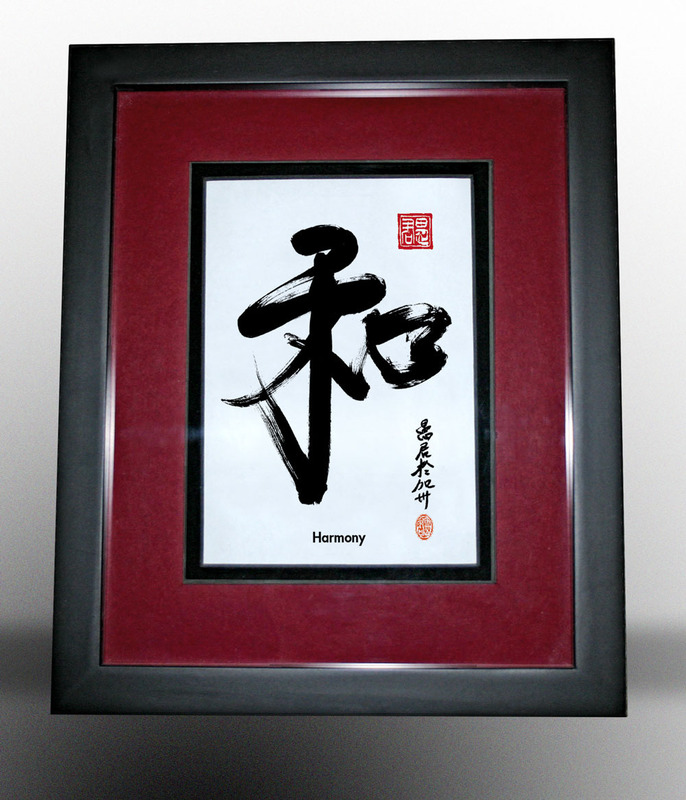 Chinese calligraphy characters displayed in a smooth black frame with a unique "floating" maroon/black double mat (a spacer creates a shadow between the mats). Frame size: 9" x 11" with 4.5" x 6.5" character insert. 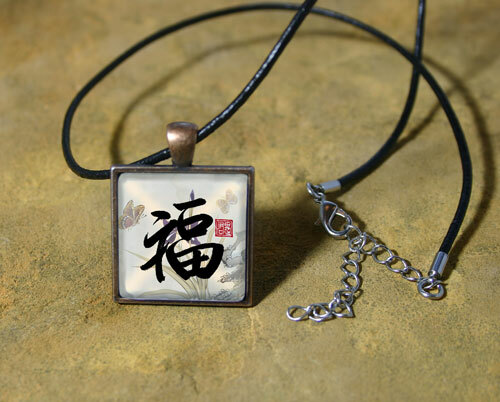 We've taken our Chinese calligraphy and reduced it to fit into custom glass pendants. 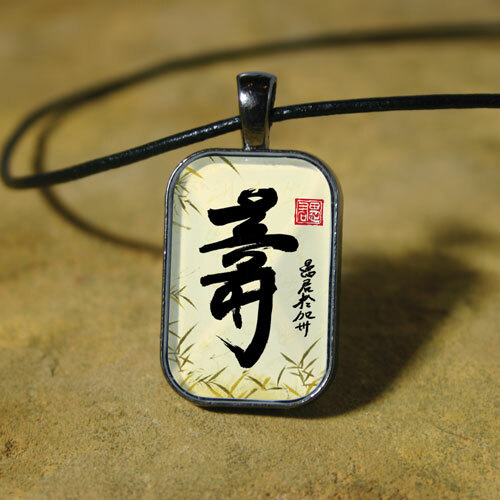 The calligraphy is superimposed over faint asian-inspired images, then covered with thick glass. The glass magnifies the image slightly and the bezel's finish and thick casting gives it a vintage look. The pendant can be purchased as a necklace with an 18" length black leather cord necklace with end cap, lobster clasp, and a 2" adjustable chain extender (18" - 20"), or as a keychain with lobster clasp, swivel, and key ring. Both come in a silk jewelry gift pouch, making it a great gift item. Over 20 different designs available with a choice of 3 bezel colors: Polished Silver, Vintage Copper, or Gunmetal Silver.